← The Right Way to hang Curtains and Drapes. ROSES, Planting, Pruning and General Care. I think the Roseis the most loved of all the garden flowers. In Spring, you see them for sale everywhere, from garden centers, to your local supermarket. They are also available through mail order catalog companies. Roses come packaged a few ways. If you buy one at a garden center, it will most likely be planted in soil, in a 2 or 3 gallon plastic pot. If you buy one at the supermarket, it might come in a kind of plastic bag, with a sphagnum peat moss/soil less mix surrounding the root system. If you order roses through a mail order catalog company, the rose will come bare root, just wrapped in plastic. Sending roses bare root keeps shipping costs down. Whatever way you get your roses, is fine. The main thing is how you handle the plant after you get it home. Planting Roses …Roses should be planted in an area that gets full sun. Most people consider full sun 6 plus hours of direct sunshine per day. Pick a site where the rose can have space. They like air movement around them. After you have decided where to site the rose, the next thing is digging a hole, and amending (improving) the soil. Dig a hole 1 1/2 to 2 times as wide as the root system of the rose. Make sure you dig a deep hole. After digging the hole, fill it to the top with water, and wait for it to all drain away. Take the soil that you took from the hole, and to it, add a shovel or two each of dehydrated cow manure and sphagnum peat moss. You can mix the different elements together in a wheel barrel, or on a piece of cardboard or tarp that you place on the ground. Now the Important Step. Planting the rose-bush deep enough. Roses come two ways, Grafted and Grown on their own Root System. Grafted roses have the root system of one kind of rose, but the top of the plant, the part that you see, and produces the flowers is another rose. The place where the graft starts is at the knot where the rose canes grow from. (see illustration 1). Roses that grow on their own root system, are the same rose variety from the top of the canes, to the ends of the root system. The number one thing you must do when planting any kind of rose is to make sure that the knot is covered with about 2 inches of soil. 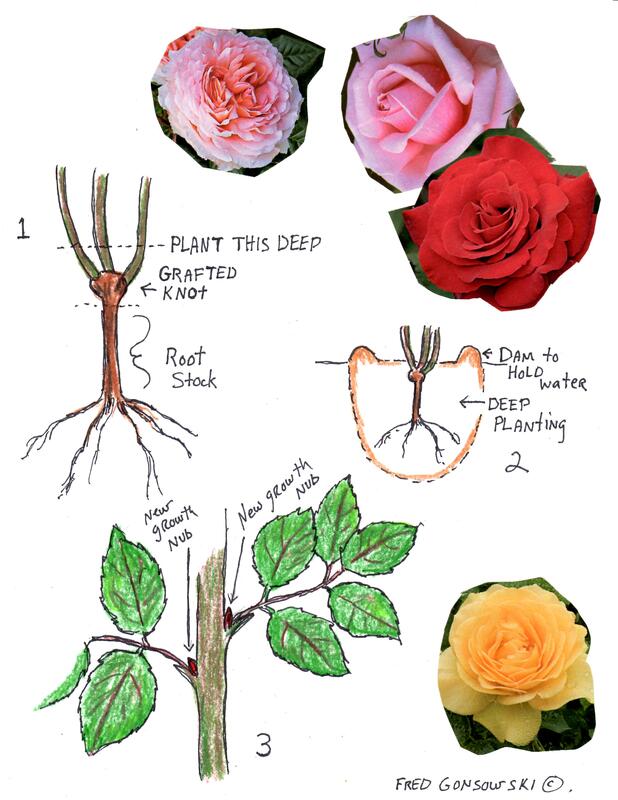 Even if you buy a potted rose, and that knot is just sitting on the top of the soil line, or floating an inch or two above the soil line, plant that knot so it is covered. If you live in an area of cold winters, as I do, zone 5-4 Upper Hudson Valley of New York State, you want to protect that knot from being winter frozen and burnt by the wind. It will kill the rose. After placing you rose in the hole, back fill it with the amended soil. Take your hands, and firmly press down all around the rose to make sure there are no underground air pockets around the plant’s roots. Next give the rose a good watering, and see if any of the soil settles. Add more soil if necessary. If you can, make a little wall of dirt (dam) around the rose to hold water when watering. (see illustration 2). Water the rose twice a week for the first month or two, while it is establishing itself. Once a week there after. By watering, I mean making a puddle on the ground, not some kind of light sprinkle. You have to get water deep down, to the bottom of the hole you dug. First Feeding .. The first feeding of your new rose, and the first feeding each Spring, when you see the canes leaf out is with 1 cup of Epsom Salt. Sprinkle it out, all around the plant. Don’t just put it by the trunk. A month or so later you can feed it with a water soluble Rose Food (follow box directions), or you can apply a granular Rose Food (follow box directions). When applying any kind of fertilizer, follow the directions for the amount to use, on the package. Don’t up the amount, it will burn the plant. In my area feeding of perennials stops August 1. After August 1, you don’t want to stimulate the plant, or encourage new growth. You want to let the plant naturally slow down to prepare itself for winter dormancy. Pruning Rose Bushes …The first pruning of all rose bushes is in early Spring. You want to wait until the bush just starts to leaf out. Cut away any brownish-black dead canes to where they look green. You can also prune the bush back to any desired height at this time. The second pruning is after the flower has bloomed and wilted. Working your way down from the head of the spent rose flower, cut just above a grouping of five leaves. (The part of the stem with 5 leaves is thicker, than with 3 leaves). This pruning will determine which direction your rose cane continues to grow. Look at the place on the cane where the leaf grouping grows out from the cane. Notice that little red nub. That is the place where the next part of the cane, and more flowers will come from. (see illustration 3). There are red nubs at each leaf grouping. You must pick, because where you cut, will direct which way the plant will continue growing. Leaves that start on the outside of the cane will produce more of an outside directed growth, leaves on the inside will produce more inward directed growth. If you ever see a shoot developing from the base of the rose plant, and it has pale green leaves, as compared to the dark green leaves of the rest of the plant, cut it out. That rose is trying to revert back, and go wild. Terms to Describe Roses …There are a few terms to describe roses…Floribunda means many flowers, and Grandiflora means large rose heads. There are many different varieties of roses. There are Hybrid Tea, Shrub Roses, Landscape Roses, David Austin old-fashioned Roses, Climbing Roses, and now the Knockout Rose. Any of the just mentioned roses, might be wonderful in the garden of someone else, but I am a busy man, and I favor roses that need minimal maintenance. No spraying or dusting for me! I have some David Austin roses in the garden, here at Whimsey Hill. They are basically easy maintenance. My neighbors have Knockout roses by their sun room. They are wonderful! They need minimal, to no upkeep, they bloom June until late Fall, constantly producing flowers, and are a truly easy to have rose, for a person who might not have a green thumb. As for black spot and all other kinds of diseases forget it. Late last Summer, I was looking through a High End garden center in my area. Their roses, in August, were just as ratty looking as mine, and they had theirs up for sale at Full Price. Preparing Roses for Winter …The middle/end of October is the time to start getting roses ready for winter. If the roses are still blooming, when the flower fades, don’t take the spent head off. Leave the rose hip (seed pod) in place. The plant wants to feel it made a seed. To protect the rose for winter, make a mound of leaves, mulch, grasses from day lilies, frost bit hosta leaves, etc 1 foot to 1 1/2 foot around, and on top of the base of the rose-bush. This plant material will insulate the rose, keeping a more even temperature for the plant, which cuts back on thawing and refreezing. The mound also protects the base of the plant from burning winter winds. If your rose is planted in a high wind area, hammer or push some Sturdy Sticks (plastic covered metal stakes) or bamboo sticks in the ground, close to the plant. Tie the canes to the sticks with some jute. This will prevent the rose from whipping in the wind, which could loosed it from the ground. Another winter protective measure would be to wrap the mounded and pole tied rose with some burlap to cut winter winds further. A gardening friend once said “June is the month for Roses”, and it should have stayed that way. Man, with all his knowledge and abilities has done what he thinks improved the rose. He genetically corrected it, so it has a longer stem, but then lost the wonderful smell. He made it so they bloom for a more extended period of time, but by doing that, made them a buffet for Japanese Beatles. So now I think you know enough to get through a full year of rose maintenance. Hopefully after reading this post, you know more than when you started. Happy Rose Gardening! This entry was posted in Bushes, Shrubs, Trees, Roses, Peonies, Tulips, etc, The Autumn(Fall) Garden, The Spring Garden, The Summer Garden. Bookmark the permalink. 2 Responses to ROSES, Planting, Pruning and General Care. So good to see you yesterday, Fred, and now to get to to see your illustrations on your blog. Wow, I wish I could draw! Hope you’re getting some good rain today as we are over my way. Margaret, being able to draw or not, I have always thought you had a really artistic way of shooting the landscape and plants. You have a good eye when it comes to positioning the subject in the picture plane. As for the rain, I look for some dry days, so I can go out and WEED the garden, and plant up my containers.